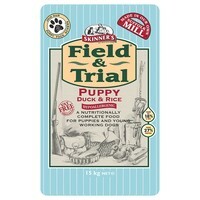 Skinners Field and Trial Puppy Food is a complete and balanced hypoallergenic meal that has been specially formulated to meet the nutritional requirements of puppies and young working dogs. It can be fed from weaning up to approximately six months of age and will ensure that your puppy receives all the proteins, carbohydrates, vitamins, minerals and oils which are essential for steady growth. Skinners Field and Trial Puppy also contains MOS, which is a natural digestion enhancer derived from vegetable sources, to help maintain a healthy digestive system. It also contains marine algae providing levels of DHA Omega-3 which provides many natural health benefits.